The Pajama Trend: take it or leave it? The question is: do we have to take everything to the streets? I am not really a pajama person, not even in the bedroom. So you might understand that I have some difficulty with the pajama trend right now. After many try-outs the last few years, the pajama styles we’ve seen on the runway this season, are “acceptable”. What is that secret force that makes designers want to continuously put these pajamas on the runway? The only person who managed to look gorgeous in her pajamas thus far, is Olivia Palermo in her Tibi look in 2011. 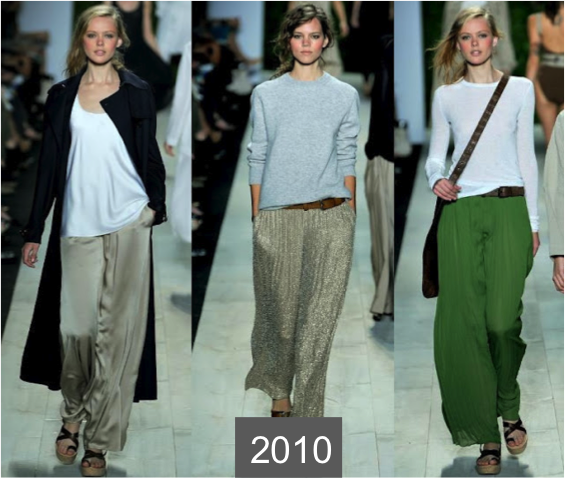 In 2010, the designers mainly sticked to pajama pants and I think that is, with the print and floral pants in stores today, a very good look to play with. This entry was posted in Fashion and tagged pajama trend by sofischoice. Bookmark the permalink.